24-year-old Nabulya Sarah from Masaka, a district in central Uganda, is more than another fistula statistic in Uganda. While writing out her request for quality reproductive and maternal healthcare for the What Women Want campaign, I could see the displeasure and frustration on Sarah’s face. She was at Kitovu Mission Hospital, where she had been referred for treatment following childbirth due to obstetric fistula, a vaginal birth injury resulting from prolonged obstructed labor without timely medical intervention or caesarean section. “Upon arrival,” Sarah narrated, “I was informed that the only doctor at the health center had taken a break.” She ended up with fistula. Due to the continuous leakage of urine and/or feces, obstetric fistula leaves women like Sarah stigmatized and neglected by both the family and the community. 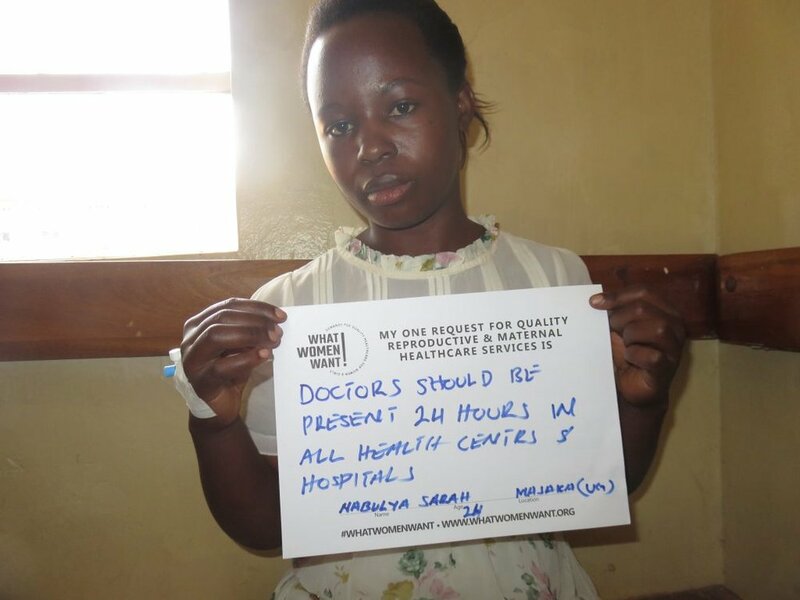 Her priority request for the What Women Want global campaign is a 24-hour coverage of all health facilities by skilled staff, especially doctors. Uganda has a backlog of 75,000-100,000 women who are in need of medical care to repair obstetric injuries. Between 1,400 and 1,900 more women develop obstetric fistula, yet only about 2,000 cases are treated annually. Harrowing tales like Sarah’s and the appalling statistics compelled EngenderHealth Uganda to implement a program called Fistula Care Plus (FC+) with support from USAID, which works to reduce the backlog of women seeking treatment for obstetric fistula by helping women like Sarah get the medical care they need so they can once again be fully functioning members of society. Fistula Care Plus supports two public and three private non-profit institutions to offer free obstetric fistula treatment services through pooled efforts, commonly known as treatment camps. Many expectant women lack adequate knowledge about when, where, and how to seek health care. They face challenges of poor birth preparedness, including not knowing which health facility to deliver at and having no means of transport to get there, causing many women to arrive at health facilities late with complications like fetal distress, which can require an urgent caesarean section or other interventions. The health facilities are often understaffed with staff overworked to the extent that stations within the facility are left unattended if a critical health worker takes a rest. This is a leading cause of poor obstetric outcomes in Uganda. The What Women Want campaign has provided EngenderHealth Uganda with an opportunity to get first-hand information about the women’s priority concerns regarding sexual and reproductive health and rights. From their responses, we’ve learned they fundamentally want their rights respected and to have healthy reproductive lives. The need for better services to prevent obstetric fistula is just one of the women’s requests for quality reproductive and maternal health care. Many other women also want to be treated with dignity and respect. Brenda took the What Women Want survey at her roadside stall selling mangoes in Kiboga along Hoima-Kampala Roads. She represents scores of women who have suffered disrespect and abuse from health care providers when seeking health services. Her priority request is that midwives be more caring to pregnant women. Unprofessional behavior by health workers, like what Brenda experienced, influences women’s future decisions on whether to deliver at a health facility or not. Women are left with the difficult decision of whether to deliver at a health facility and suffer the shame, embarrassment and disrespect from some health care providers; or to deliver in places without any professional health services knowing they will be treated with kindness. Giving birth without professional care exposes women to many health-related risks, including obstetric fistula or even death. Despite efforts made to increase access to maternal health care, Uganda’s maternal mortality is still high, at 336 out of every 100,000. For every maternal death that occurs, 20-30 women sustain life-threatening morbidities, including obstetric fistula. While initiatives like Fistula Care Plus address the treatment option of fistula, there is an urgent need to improve the quality of care, which in turn will drive demand for those services. By providing quality healthcare based on women’s and girls’ perspectives, we can ensure that their health rights are upheld and that health services are fully utilized.